FS Original Jetbeam RRT-01 NOS w short pocket clips, modded to Carclo Triple with choice of N219b High CRI. Note the triples have a more uniform beam than the singles. 2. Triple N219b 4500k 9080. Note the singles have a ring in the spill of the beam. 3. Single N219b 3500k 9080 with the stock Orange Peel reflector and short clip. 4. Single N219b 4500k 9080 with the stock Orange Peel reflector and short clip. Note the original has a ring in the outer spill of the beam. If interested, please send me a PM to discuss your preferences, and any questions. I have been EDCing an RRT-01 for a few months, modded to single N219b 4500k 9080. I am in love with the LED, and the UI. This week I started carrying a triple N219b 3500k 9080, and I love it in the evening, indoors, and as a nightstand light. These lights accept UnProtected 18350, plus protected 16340, and CR123 Primaries. 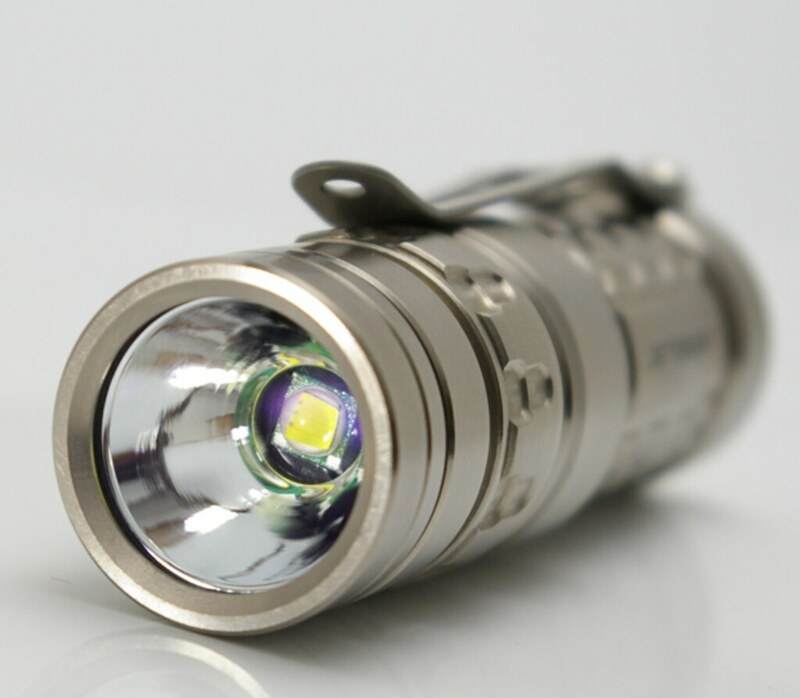 They produce about 350 lumens on 16340 and about 450 lumens on 18350. I really like the ability to smoothly ramp to super low levels, below anything I could do with any of my other lights, without ever using a clicky code. In fact, there is No Button to click! 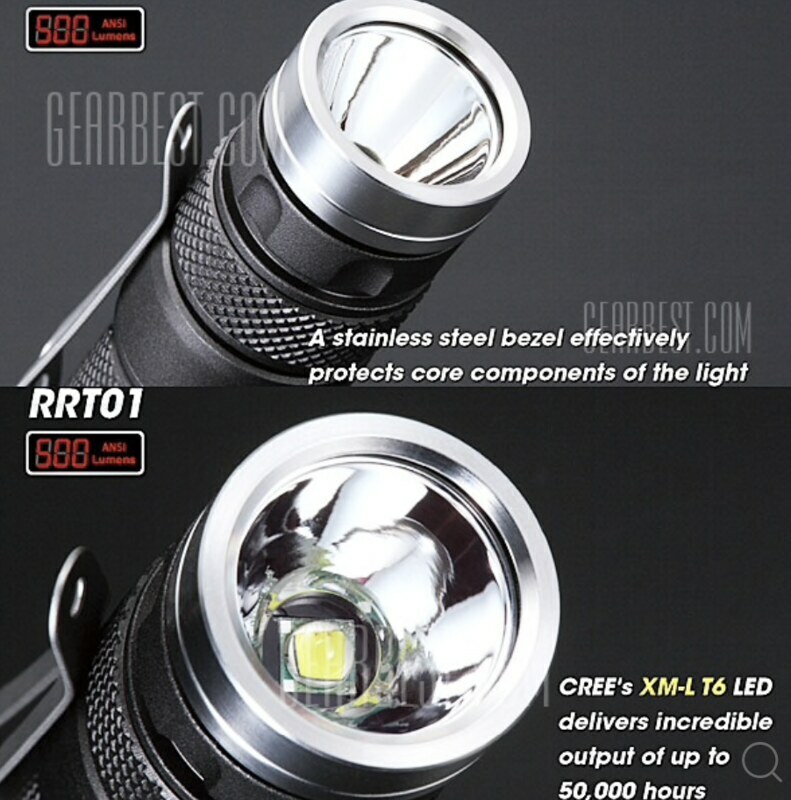 The light in the middle is the Original RRT-01 body style, with short clip, and is the model being offered. Original has no trit slots, new version has Yes trit slots. I prefer the Original version RRT-01, which is why Im making them available. Others are offering the new version, if you want a single LED, vinh is selling a number of different LED options. If you want a quadtrix with E17a, Clemence will probably offer that configuration, once he finishes testing the light. Contact them directly, Im not in charge of those offerings. This original RRT-01 has been discontinued since 2016 as far as I know. None NIB could be found anywhere for several years, it was difficult just to find a used one someone would be willing to let go of. 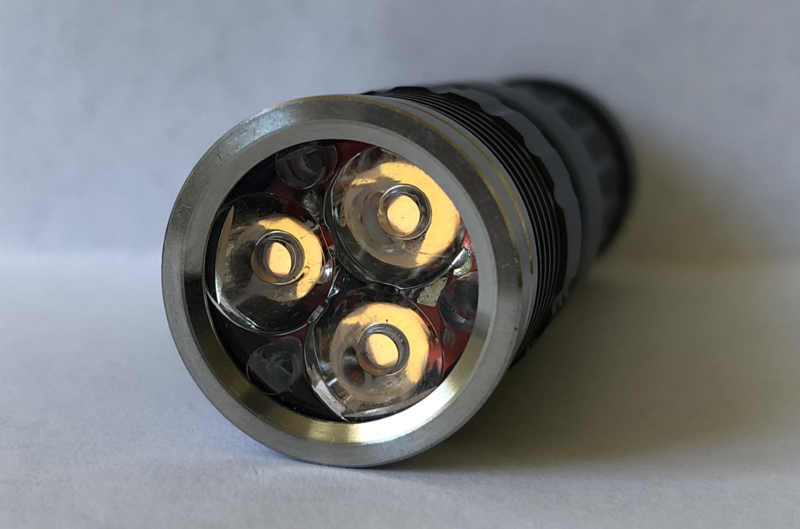 This is a great opportunity to own a classic light that has to be ranked at the top of the 10 best EDC lights of all time, at least if I was ranking them . It’s a awesome 18350, short clip, easy to operate, lite weight, super low moonlight, and tough with the options for high cri and a triple. Thanks jon_slider for offering possibly the last NIB original RRT-01’s around with great options. Awesome, dropped you a PM. One more available in this set. PM me how you want it built, and shipping address so I can get you a quote..
Nobody is obligated, until you give me an address and accept the price with shipping, and then paypal me. Im hoping that by next month at this time you will have your light in hand. PM sent for your last available. Please PM me if you want to order or have questions. some beamshots, iPhone, auto white balance, 8am overcast. This is to show beam shape, not tint or color temperature. imho, the 4500k is the most versatile EDC. During the day it looks pink, at night it looks bright white. This is due to differences in the white balance of my brain, under different ambient color temperatures. The 3500k is a beautiful warm color, I prefer it at night, and on the nightstand, at which time the 4500k is cooler white than necessary, imo. bear in mind my bias is that I use 3000k incandescent in my home. Compared to incandescent the 3500k looks slightly “whiter”, as it is slightly cooler. The 4500k actually looks blue by comparison. we all owe a huge debt of gratitude to pinkpanda3310, who has agreed to build these lights for us. Im also very grateful to everyone that is participating in this group buy project. It is my first experience organizing, and Im honored to have everyone’s trust. I will place the order for a total of 12 lights in this set, later today. Optics, boards and LEDs have also been ordered. We should be docking for Shore Leave in about 10days, to begin modding and assembly. This is a truly International Crew, LEDs coming from Andy Zhu in California, Lights flying across OZ, to be modded by pinkpanda3310, currently on 10 day leave in Japan, reservations organized by yours truly in Cali, with additional support from Msrs Noctigton and Carclo 10507 (with a bonus 10508 included at no added expense to you), from parts known. Stay tuned for further updates and weather forecasts.. Anyone who missed the boat and is interested in catching the next Wave, PM me and I will start an interest list, and will update if another Cruise can be organized. There are potentially 50 berths available but presently no Master Modder has been enlisted. This round is being built with the generous support of pinkpanda, because he wanted to show some love to the BLF community, as he is working for peanuts. The man is an Artiste with a Big Heart! I am very grateful to be on board with all of you. Thanks for everyone’s effort and Jonathan’s excellent communication! it was you that inspired me to discover the RRT-01, after which I sold my HDS Rotary, because I prefer the RRT-01. self adhesive and removable, whats not to like? This round is being built with the generous support of pinkpanda, because he wanted to show some love to the BLF community, as he is working for peanuts. The man is an Artiste with a Big Heart! Well done Jon & pinkpanda. That would be great Jon. Thanks for trying. Hey you all. Since i’ve missed first wave i’d like to get on another one. Theoretically wouldn’t the output be higher with the new RRT-01? will need to determine if pinkpanda is willing to build more, after this round is done.. Yes, I think the new model has higher driver current. Stay tuned for the offering from Clemence, he is testing a new model to be built with E17a quadrix and triple. thanks for your possible interest in the Original model.. I will post here when a new batch is planned. Im happy to organize the build, there are many more Original RRT-01 available in stock form.. I just dont know yet if pinkpanda will be interested in the job again. He agreed to do this round more out of kindness than capitalism. 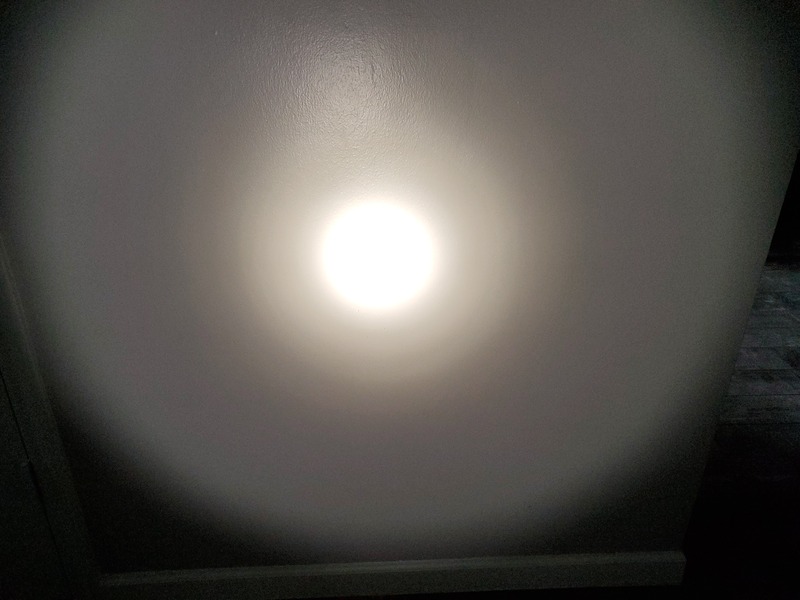 Im also interested in promoting a batch of single LED Original RRT-01, converted to N219b, but there are rings in the beam that I have not yet figured out how to overcome. Im hoping someone with a lathe will take the project on. It entails a bit more than just an LED swap. I would like to organize another batch of modded RRT-01, w single N219b. If anyone here wants to collaborate, please PM me. so, when I tell you the single LED mod to the RRT-01 has rings in the beam, it does, just like an HDS.. LOL! from which I infer that with 18350, the triple 3500k, despite having a less efficient LED is making 30% more lumens than the single 4500k. from which I infer that with 16340, the triple 3500k, despite having a less efficient LED is making 16% more lumens than the single 4500k. fwiw, the single 4500k LED uses half as many lumens as the triple 3500k to illuminate its hotspot, because its a smaller area.. Need to swap in a different reflector to get rid of the rings in the beam. And even then there may still be a slight ring at the edge due to reflection of the edge of the bezel. I like the shape of the old RRT-01 better than the 2019 version. However, the 2019 version definitely has a better beam pattern. Need to swap in a different reflector to get rid of the rings in the beam. which reflector do we need, something from an early SPA Defense Novatac? I only have Orange peel on mine.. they are not very good, they have rings in the beam, in fact, they look like the reflectors in the later issued Novatacs, that have visible rings at the base of the reflector surface itself, almost like a fresnel lens..
earlier novatacs had better reflectors, with tighter hotspots and no rings. the 2019 version definitely has a better beam pattern. I can see concentric rings in the corona, that resemble the rings in the reflector pictured on the right in the group of 3 reflectors above. The rings get worse with the smaller N219b swap. I have a beat-up early run old version RRT-01. That light originally shipped with a smooth reflector. It had one of the ringiest beams I’ve ever seen. Absolutely horrible. The new 2019 version’s beam pattern looks perfect in comparison. I recall at the time the old RRT-01 came out lots of other people complained about the bad beam pattern. Someone found an OP reflector on one of the big budget sites that fit with only slight modification. That reflector gives a fairly clean beam pattern. Unfortunately, I don’t recall which budget site I got the reflector at or what the correct size is. I recall the Niteye Eye10 shipped from the start with an OP reflector which gave a better beam. I think later run early version RRT-01s were changed to an OP reflector and short clip. I really love my TCR-01. Great light. But when it comes time to grab a light it feels awkward. 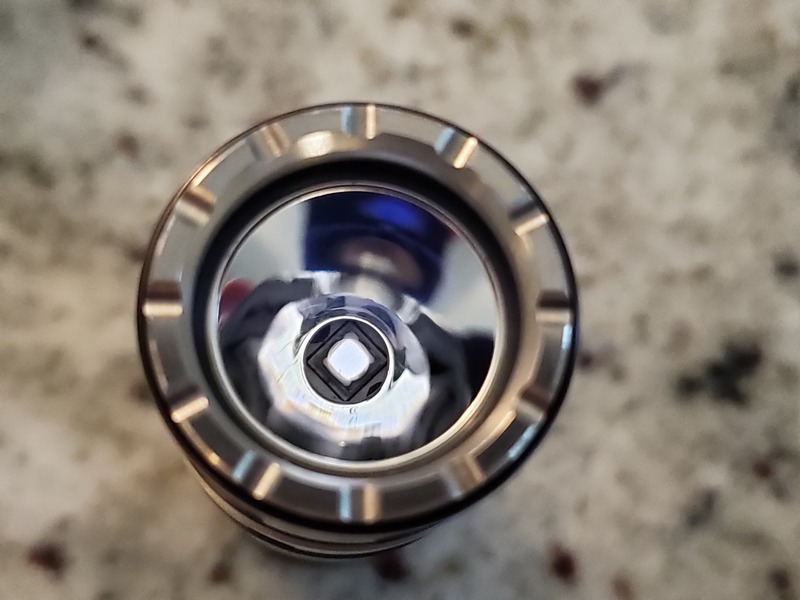 I could grab the beautiful TCR-01 with 5A2 XPL HI installed and maybe 500 lumens output, or I could grab my modded Emisar D4 with 18500 tube, metal switch button, quad 95CRI 4000K SST20 and Lee 279 minus green filter. 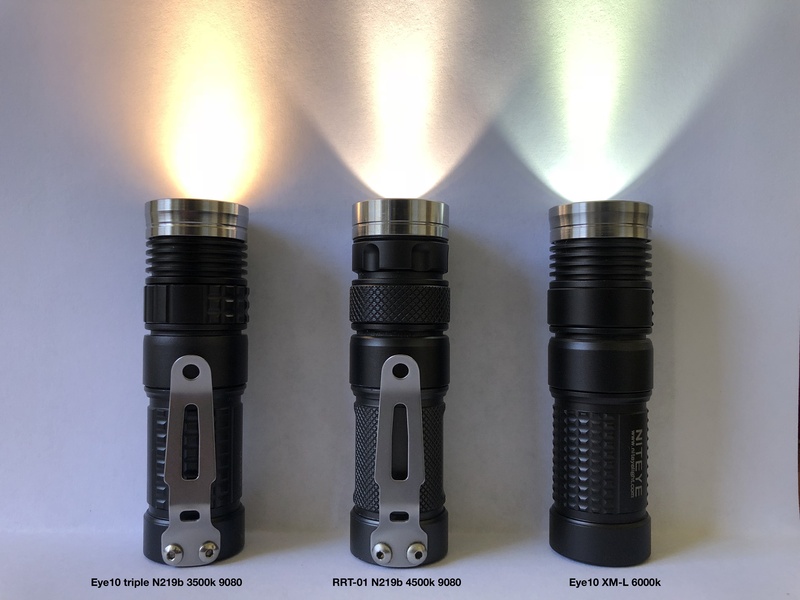 Both lights are about the same size and feel great in the hand, but the Emisar has 6x the output, better CRI, better tint, more throw, and more flood. I have a beat-up early run old version RRT-01. That light originally shipped with smooth reflector. It had one of the ringiest beams I’ve ever seen. Im also unimpressed with the OP reflectors that followed in the second run of Original RRT-01 and Eye10 that also have short pocket clips. 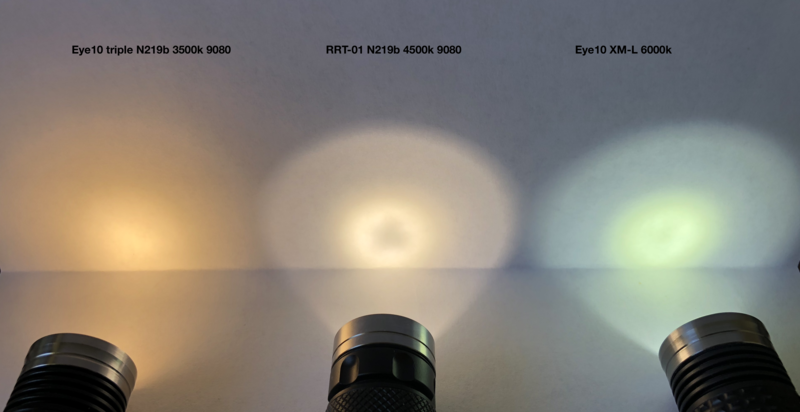 the smaller N219 die is not well matched to the OP reflector in the second run Original RRT-01, that are the ones this Group Wave has obtained. We should visit some of the budget sites and see if we can find a reflector that is a better match. Or maybe a single-emitter TIR. Are those HDS beam shots an older light that was modded to 219? The currently used reflector sits a little lower I think. My 219b HDS has no rings at all in the beam. yes, Tir would solve the rings problem Im seeing with Original RRT-01 reflectors. can Tir give as small a hotspot as a reflector?